Photos of Lambley Viaduct and the River South Tyne in Northumberland. These photos were taken along part of the South Tyne Trail along the trackbed of the Haltwhistle to Alston Railway and the River South Tyne at Lambley. Footbridge across the River South Tyne. View across the River South Tyne to Lambley. 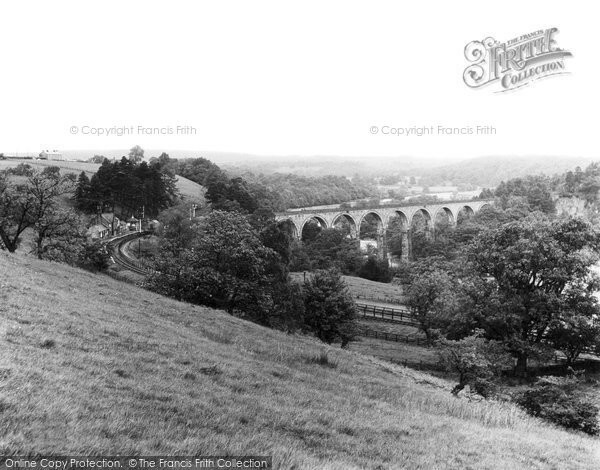 Views along Lambley Viaduct looking south. Views along Lambley Viaduct looking north. Plaque at the south end of the viaduct. Views down to the nearby footbridge over the River South Tyne. Steps from the viaduct leading down to the path to the footbridge. Views of the River South Tyne looking through the viaduct arches. Views along the river to the footbridge. Views across the very narrow footbridge. Views along the river from the footbridge. Old buffer near Coanwood Station. Platform and trackbed at Coanwood Station. Old crossing gate at Coanwood Station. Trackbed and footpath from Coanwood Station to Lambley Viaduct.